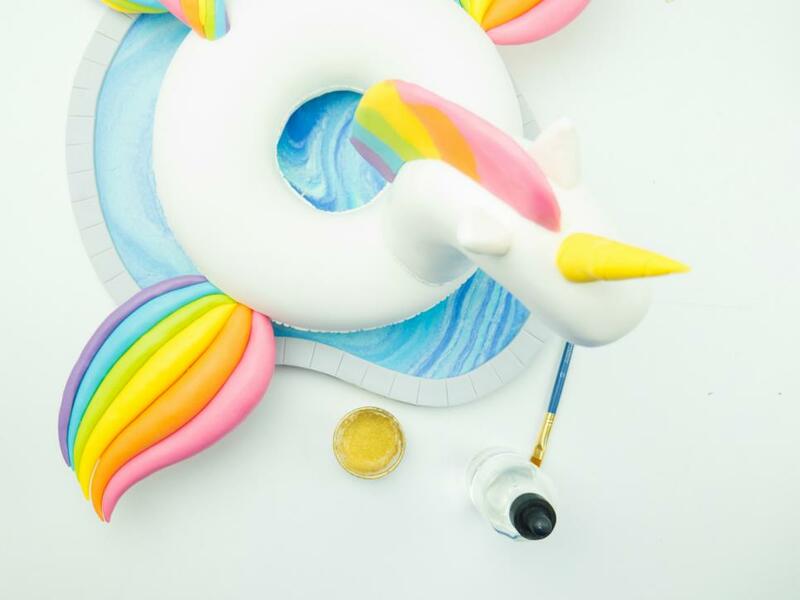 This rainbow-winged unicorn cake is ready to make waves. 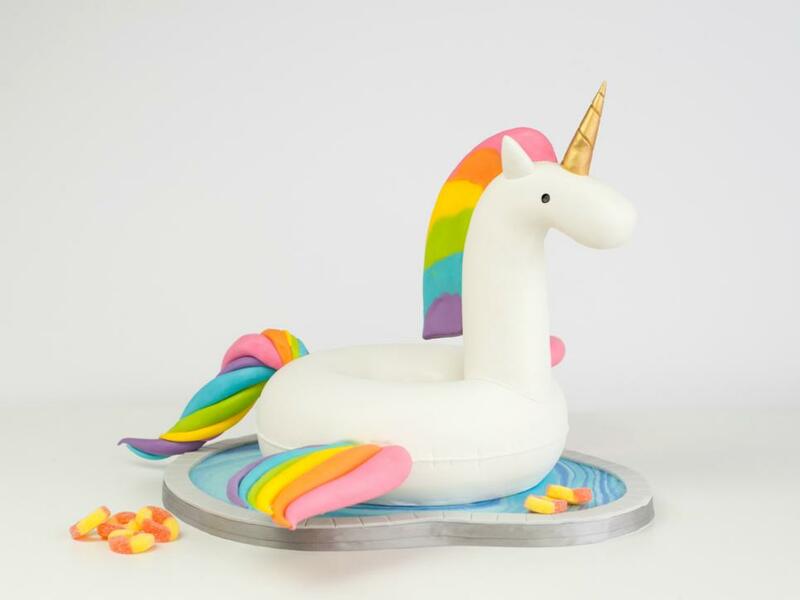 Whether or not you have access to float-worthy waters this summer, this unicorn cake is perfect for bringing pool party vibes to any event. 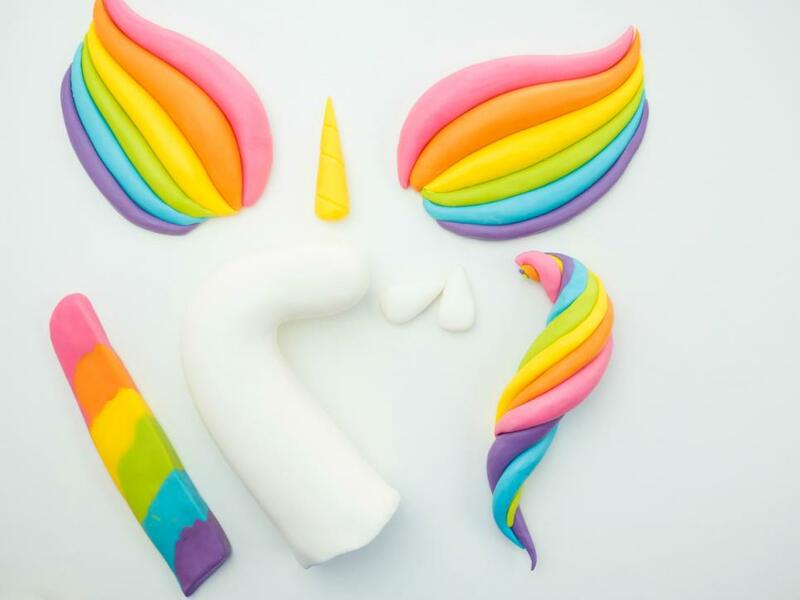 Follow our easy step-by-step guide to craft this magical cake, from golden horn to rainbow swirl tail. 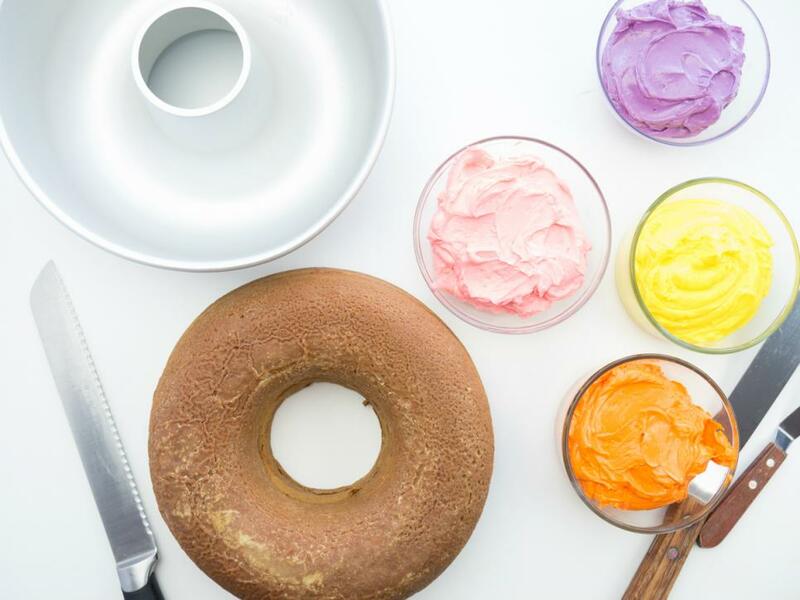 Prepare your cake recipe in a large doughnut pan. 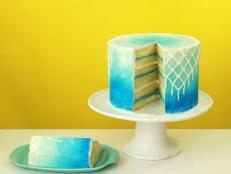 Bake and let the cake cool. 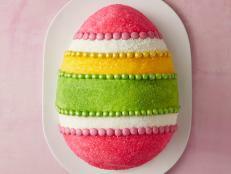 Once cool, cover in plastic wrap and refrigerate for at least 1 hour before beginning to decorate. 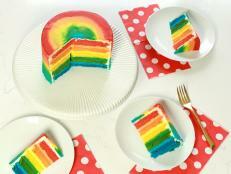 A chilled cake is much easier to slice. Make the Swiss meringue buttercream. Once you have made your vanilla buttercream, divide it into five bowls. Keep one bowl white and add gel food color to the other four bowls. 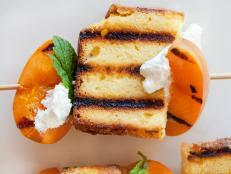 Use serrated knife to slice the cake into five layers. Starting with the top layer of the cake, place upside down and use pallet knife to spread pink buttercream evenly over the layer. 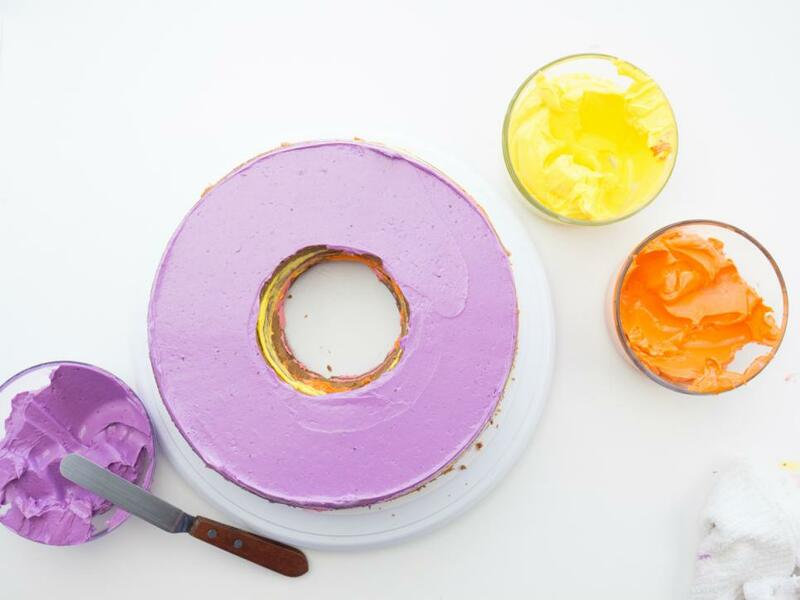 Repeat frosting process for each cake layer with orange, yellow and purple buttercream. 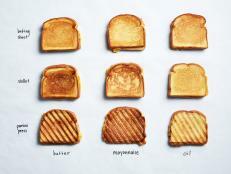 The last layer should be the one that was at the bottom of the pan. Chill the cake. 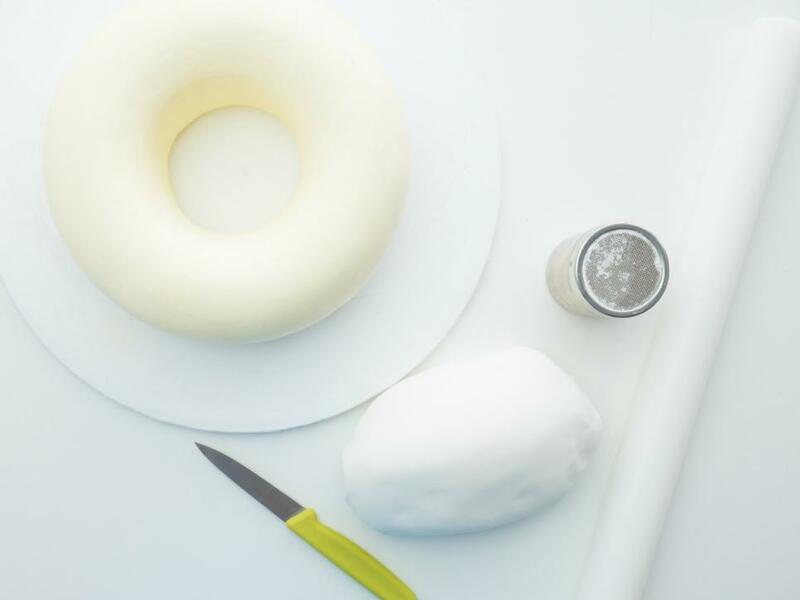 Trim the bottom edge of the cake to form it into a true doughnut shape. Continue trimming the edges until you are happy with the shape. 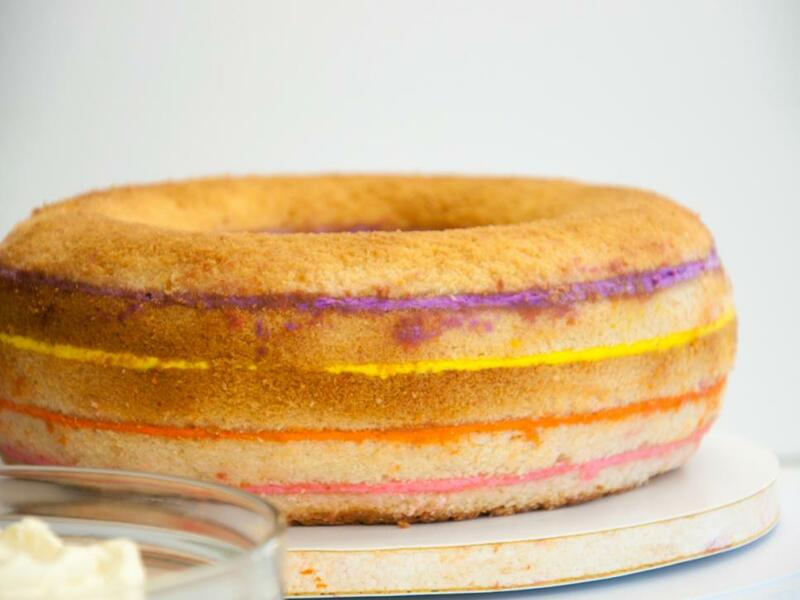 Cover the cake with a thin layer of buttercream (the crumb coat). Smooth out and chill the cake for at least 15 minutes. 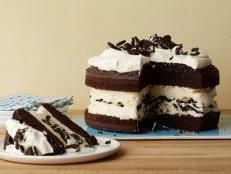 Then, cover with another more generous layer of buttercream. Smooth out as much as you can and chill for another 15 minutes. Roll out a large piece of fondant, using corn starch so it doesn’t stick to the counter. 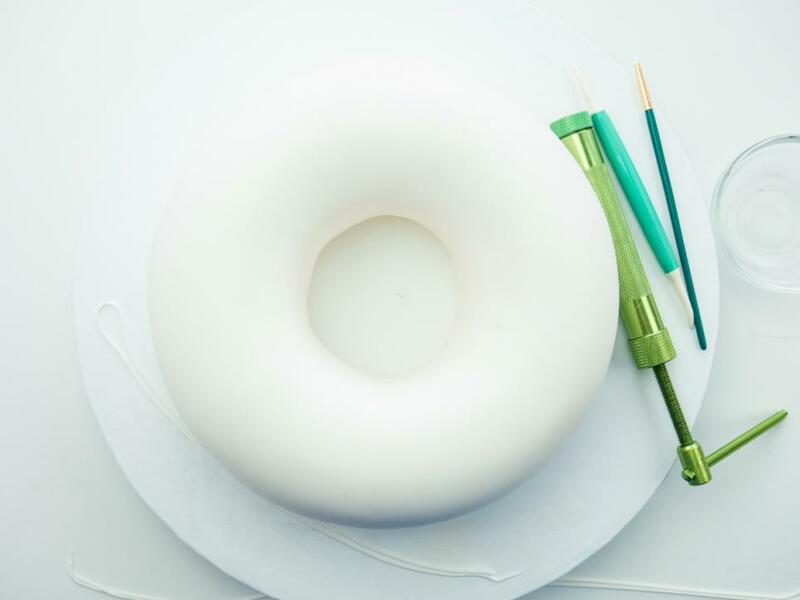 Measure your cake to make sure you roll the fondant big enough. 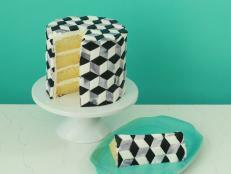 Cut a small hole in the middle of the fondant before lifting it onto the cake. Smooth with the palms of your hands. 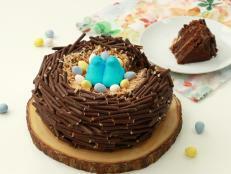 Use paring knife to cut away any extra fondant. 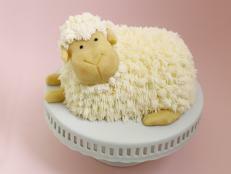 Use the extruder to make a string of white fondant. 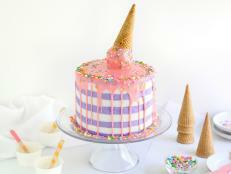 Using water as glue, attach the string around the cake. Use a Dresden tool to create the tufted and pulled effect of the floaty. 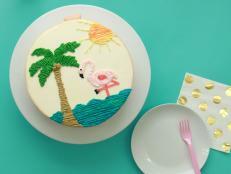 Tip: Chill the cake while you make the rest of the decorations to make sure it is nice and firm before you move the cake onto a prepared cake board. Use a large sausage shape of white modeling chocolate to create the neck and head, rounding it out nicely on one end for his face. 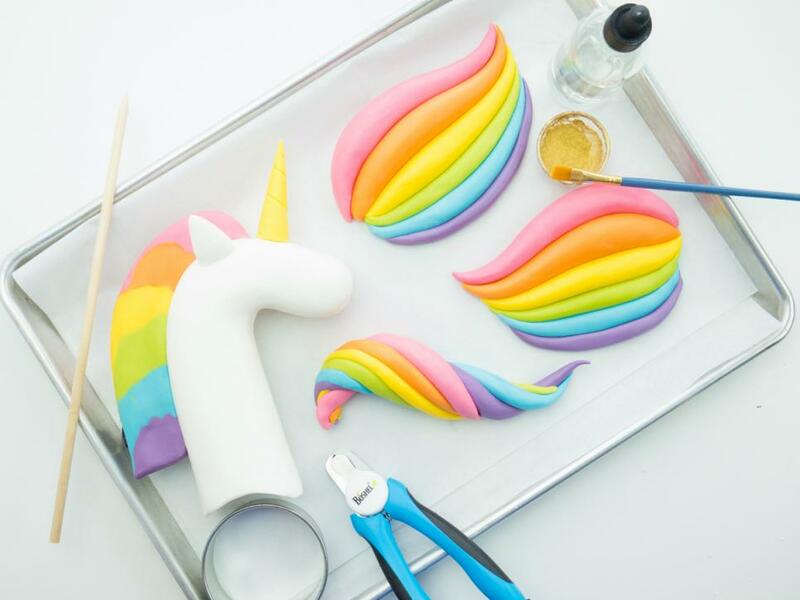 Make smaller balls of each color and form them into cones for the mane. Attach them together using water as glue. Flatten using the heat from your hand and smooth the pieces together until they look like one piece. Attach to the head. 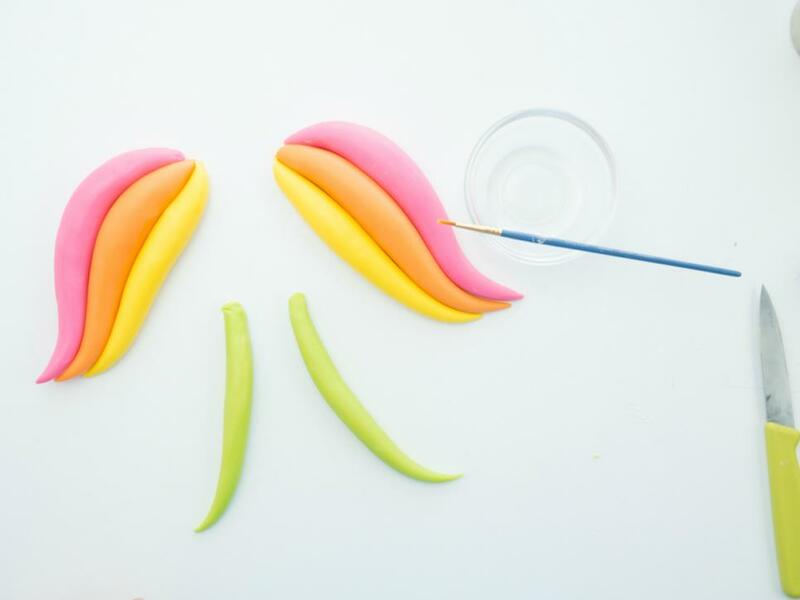 Roll a medium-sized ball of pink, orange, yellow, green, blue and purple modeling chocolate for the wings. Cut them in half and roll again into a ball. Then roll the ball into a sausage that tapers at both ends. Do this for all the colors. Attach colored pieces together with water. 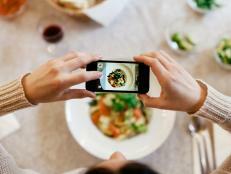 If needed, use a toothpick or two to hold them together. 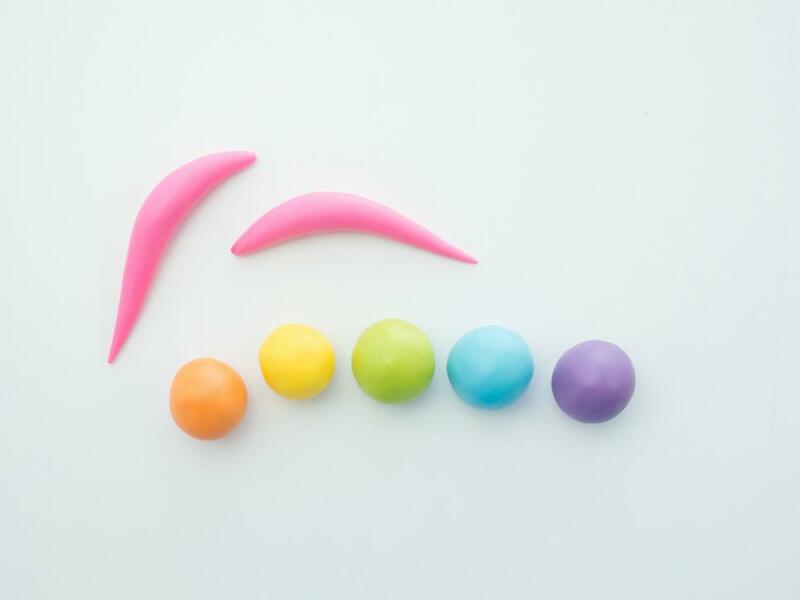 Repeat for the tail using a larger ball of each color. 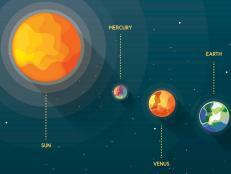 Once they are all formed, roll the colors together, making sure to taper the end of the tail. Make two small balls of white modeling chocolate, mold them into cones and flatten slightly to form the ears. 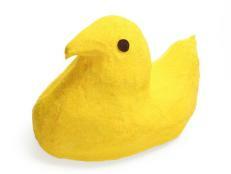 Use yellow modeling chocolate to make a skinnier, longer cone for the horn. Using a modeling tool, make an indent that curves all the way around the horn to create texture. 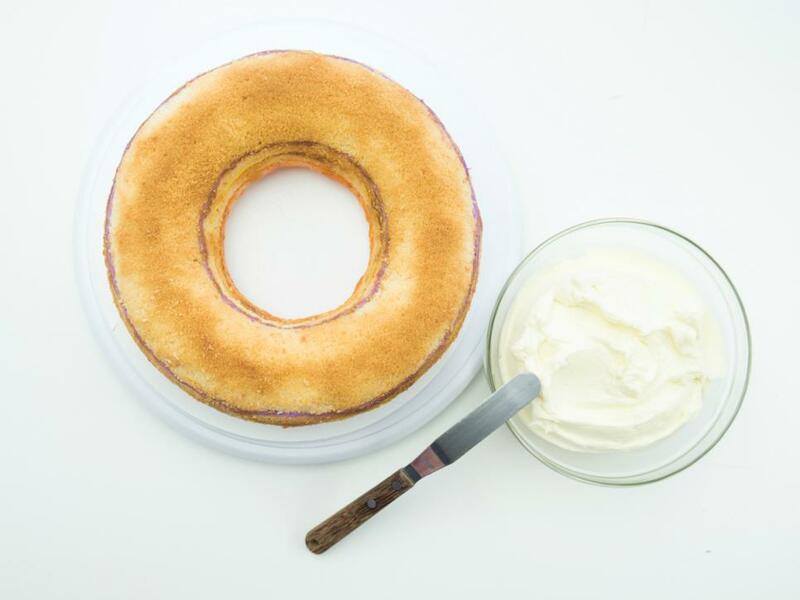 Using a round cookie cutter the same height as the cake, cut a semi-circle from the bottom of the neck. 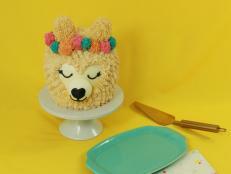 Attach the head to the cake using a large dowel (measure the length to make sure it isn't too long and cut as necessary). Make sure your dowel is vertically straight. Attach the wings and the tail using two bamboo skewers each, trimmed to size. 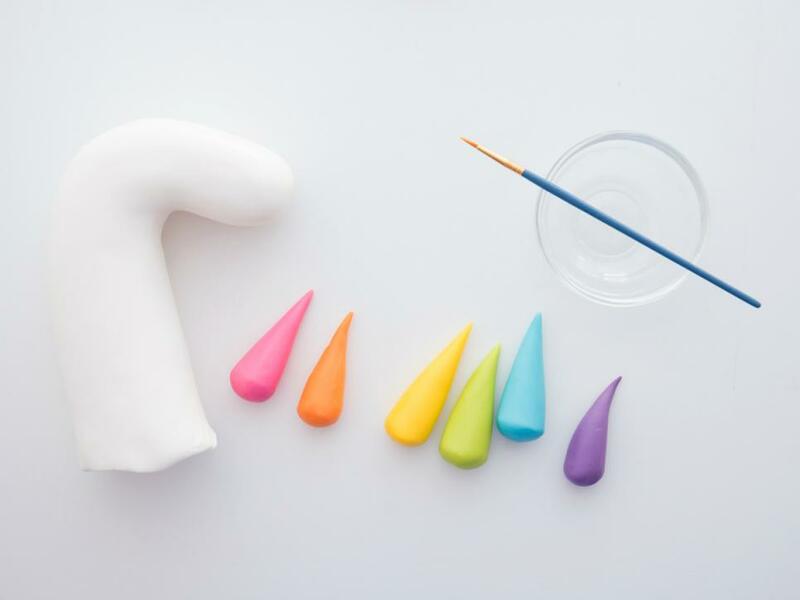 Paint the horn with gold dust mixed with a small amount of clear alcohol or lemon extract. Use a ball tool or paintbrush to paint on the eyes. 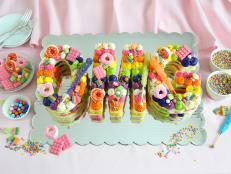 Bring your colorful creation out to wow the crowd and enjoy!